Get Ready for Your Close Up with Salon Quality Smoothness That Lasts! Forget painful plucking and expensive trips to the salon. Now you can get affordable, quality results at home, no appointment necessary! 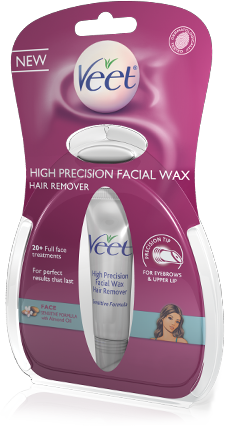 VEET High Precision Facial Wax removes unwanted facial hair easily and efficiently on delicate areas including the eyebrows, upper lip and chin. The easy-to-use tube and precision applicator tip allows for control over the flow of the wax to help you achieve the perfect shape and desired results, leaving skin smooth for up to 4 weeks. The specially formulated wax is water rinse-able for easy clean up. Plus, it contains almond oil and aloe vera, leaving skin moisturized. Cleanse the area you wish to depilate with soap and warm water, dry thoroughly. With the lid tightly in place, place the tube into a cup of hot tap water for 1 minute. Squeeze a small bead of wax and spread onto the area you want to depilate with the precision spatula in the direction of the hair growth. Place the strip over the wax and pull back in the opposite direction of hair growth in a quick, swift motion. Use an eyeliner or brow pencil to draw the desired shape on your eyebrows. It will help you achieve perfectly shaped eyebrows. 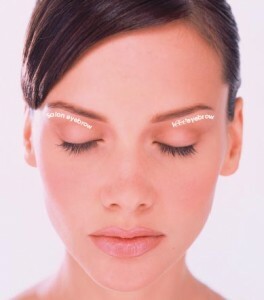 When shaping the eyebrows, do not remove too much hair at one time. You can always make your eyebrows thinner if needed. Wax your brows in front of a large mirror (not hand-held) so you can see clearly. The wax tube comes with 20 reusable strips that can be cut to size for areas like your eyebrows, upper lip and chin. If you’re new to waxing brows at home, play it safe by cutting wax strips to desired brow shape prior to application. Wax is water-rinseable, so wipe away application mistakes with a wet washcloth. To avoid in-grown hair after waxing, exfoliate and moisturize your skin regularly.